Baranuski begins the long task of watching everyone around Rin to see who he can manipulate into killing her for Lord Zeref. He transforms himself into many forms, sometimes humanoid, sometimes as a small insect or a bird. This enables Baranuski to hide and spy much easier. Baranuski decides to disguise himself as a weary traveler seeking rest and food in the village where Rin stays in able to gain information that will be useful for Zeref's evil purpose. Meanwhile Inuyasha seeks his brother to inform him of Rin's condition and to find out Sesshomaru's intentions. He concentrates and uses his smell sense to find Sesshomaru and is able to tell that he is near by, probably on his way back to see Rin. When he catches up with Sesshomaru who is now facing him, Inuyasha yells out to him, "Hey Sesshomaru, We need to talk." Sesshomaru is walking in his direction but he says nothing, so inuyasha continues, "While you were gone Rin fell ill, we had a doctor come out to Lady Kaede's to check her out." Sesshomaru tells Inuyasha, "I will go to her now." Inuyasha stops Sesshomaru, "She's fine but she's gonna have a baby Sesshomaru." Sesshomaru is somewhat stunned by this news but he hides it well as he resumes walking right past Inuyasha who then yells out, "Well, I wanna know what you plan to do about it Sesshomaru...are you gonna leave her and the baby on their own to save your empire?" Sesshomaru is insulted and snaps back, "Inuyasha, How dare you even suggest that I would forsake her and my child!!" Inuyasha explains himself, "Sesshomaru, we both know you can't have a human woman and your half human child living at the empire with you because you'll lose a lot of followers. Leaving her in the human village would be the only way to keep your throne." Sesshomaru replies, "I have many loyal followers whom will remain servants of my empire, those who would leave were not worthy of me and are free to go." Inuyasha feels doubtful of what Sesshomaru is saying," You say that now Sesshomaru but how will you really react when your kingdom starts to fall apart?" Sesshomaru quickly answers, "As long as I can care for her and our child, that is all that matters now. Inuyasha, I cursed you and your mother for many years because I believed she, being a weak mortal, was the cause of father's death. How ironic that I have now come to understand and follow father's actions.....Falling in love with a human woman, birthing a half human child with her and father sacrificed his life in the end to keep them both safe. I could never abandon Rin or our child, an empire will never be more important. Does that answer you Inuyasha?" Inuyasha is speechless and feels like a fool for doubting Sesshomaru, he can say nothing as Sesshomaru flies off to see Rin. The day that the group defeated Naraku and Kagome was drawn into darkness, everyone involved was near lady Kaede's home talking about the situation when Rin grew very tired from everything that had gone on and laid down in Lady Kaede's hut falling asleep. Sesshomaru went on his way without her but returned the very next morning to retrieve her however, Rin still had not waken, sleeping heavily due to her ordeal from the day before. Lady Kaede and Sango were together outside the hut having a conversation about Rin and Sesshomaru when he had appeared at that very moment. Lady Kaede is glad to see Sesshomaru because it is the perfect time to inform him of what she and Sango were discussing. Sesshomaru walks up to Lady Kaede, "I'm here for Rin. We have a long trip ahead, we must be off." Kaede responds, "She is still resting in the hut however before you wake her, I wanted to speak with you about Rin." Sesshomaru does not respond so Lady Kaede continues on with what she has to say, "My advice on this may not be wanted but I must provide it anyway. I feel Rin should remain here in the human village with me. Sesshomaru, she is a little human girl who hates her own kind. She has been given a false idea of what it is like to live amongst humans, She must realize that just like some demons, some humans can be kind and good also." Sesshomaru responds, " There is no need for her to feel comfort around humans, she will remain with me." Kaede explains, " She does need humans more than either of you realize. Rin is steadily growing towards becoming a woman..there are many changes a girl experiences during this transition, who will teach her what she needs to know? Who will groom her into becoming a proper woman, Will you Sesshomaru?" Sango adds to the conversation, "Sesshomaru, I can be of help to Rin as well, Kohaku and I will teach her to defend herself. I will teach her how to fight and slay evil demons, this way wether she decides to be on her own or continue her travels with you, she will be able to protect herself either way. It's the least I can do, I owe Rin that much." Sesshomaru still does not respond but does close his eyes and lowers his head in thought. Kaede continues, "Sesshomaru, do you not have plans for Rin when she comes of age?" Sango is shocked at Lady Kaede's boldness, she gasps as her eyes raise in surprise and wonder of Sesshomaru's response. Sesshomaru is not surprised at her question but he opens his eyes and he raises his head responding, "You are too wise for your own good old woman." Now that the answer to her question has been confirmed, Lady Kaede continues " Well, think of this as practice...she will live in the human village and be brought up and trained to be a proper, self reliant and well groomed woman. When the time approaches only she will make the decision of remaining with her human brethren or going off to live her life with you. Shall we agree to these terms, Sesshomaru?" Sesshomaru turns his back and says nothing for a moment but then responds, "You will be the one to inform her of this." Sesshomaru flies off with such force causing a strong gush of wind behind him that Lady Kaede and Sango have to fend off. Sango comments, "That went better than I thought it would although he didn't seem to be too pleased with us the way he stormed out of here just now." Lady Kaede responds as she watches him slowly fade away into the clouds, "He may not be pleased with the decision but he knows it's best for Rin and so he is making this sacrifice for her." When Rin wakes up Kaede explains the whole situation to her and assures her not to worry, that Sesshomaru will come to visit her. Lady Kaede is old and wise, She knows Sesshomaru will be back to visit Rin because anyone who has made the types of sacrifices and shown the type of love Sesshomaru has shown for Rin would never stay away for long, even if he is a demon. However, for many days Rin sulks and sits around in a sad state. Sitting outside watching the clouds looking for Lord Sesshomaru to come to her but he does not. Finally after waiting over one month, Sesshomaru appears holding a gift for Rin, She is so excited and happy to see him that she doesn't even notice the gift that he is holding at first. Sesshomaru continued to bring Rin gifts and visit her often until this very day. Lady Kaede's flash back finishes as she smiles and tells Rin, "I always knew that in the end, this would be the final choice you would make. It's a good choice my child, you have my blessing....ye will be happy." Rin hugs Lady Kaede and holds her tight for several minutes. Rin walks outside the hut and climbs atop of Au Un's back prepared for the long trip to the castle as Lady Kaede hands her a bag packed with food, she kisses Lady Kaede good bye one last time. Rin feels horrible that she will once again have to leave without telling Kohaku the truth or without at least saying goodbye but she does anyway. 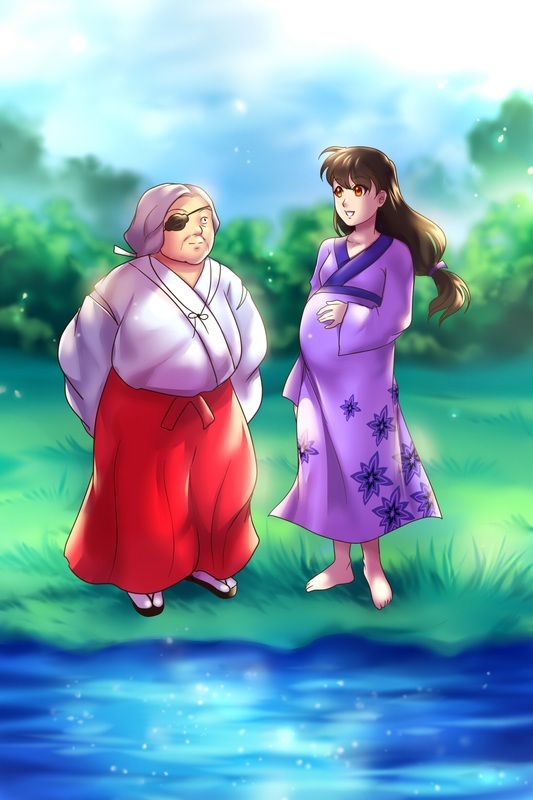 Kohaku does indeed come looking for Rin the next morning but she is unavailable, Lady Kaede simply tells Kohaku that Rin has left with her husband Sesshomaru and will not return until the time has come for her to give birth to their child. Kohaku stands there speechless as his heart drops. As several days go by Baranuski has been going from hut to hut pretending to be a weary traveler in the village that Rin and Lady Kaede reside in. He does this to get information from the villagers by asking seemingly innocent questions about the other members of the village who all undoubtedly know each other well. In that time news has spread around the village that Rin is now married to Lord Sesshomaru and they are expecting their first child in six months. Baranuski was aware of Rin having a child but he was not aware that she and Sesshomaru have become married, he starts to think that this plan of Zeref's will never work but he continues on. Meanwhile Kohaku is at Sango and the Monks home, several days have passed since the news of Rin's marriage to Sesshomaru but he still is unable to snap out of his depressed state. Sango begins to worry about him and does not want Kohaku to be alone, she knew Kohaku wanted to marry her but she was unaware that he felt this strongly for Rin. Sango hears a knock at her door and when she opens it, she sees a man who looks tired and thirsty. He asks, "Mistress, I have been traveling for many days. Would you be so kind as to supply me with bread and water, which in turn will replenish me and enable me to continue on in my travels?" Sango having a good heart invites the traveler in, unaware that it is one of Zeref's servants in disguise. She treats the stranger kindly and speaks with him, "My husband the good monk is out with the children but please sit I have soup, warm bread and water for you." he responds, "oh you are most gracious mistress." He looks in the corner and he can see Kohaku through a window sitting outside on a rock just looking out at the sky. Baranuski can sense an extreme rush of love/hate emotions coming from him and he asks Sango why the young man seems to be so blue. Sango informs that Kohaku is experiencing his first real heart break from a girl he knew since they were children, she has married someone else. Baranuski is sure she is talking about Rin the human girl that Zeref wants dead now. Baranuski starts to believe that Zeref's plan my work after all. Baranuski now knows what he needs to do, He thinks It's a shameful act Zeref wants him to perform: playing with Kohaku's heart and emotions, having Sesshomaru's new wife killed all in the hopes of catching Sesshomaru at a weak moment to gain more power. Zeref is evil and greedy indeed but it's the only way Baranuski can have his freedom back. Baranuski: "Excuse me sir, I hate to disturb you but I must refresh myself with this cool spring water. " Kohaku does not respond to the man and continues to feel sorrow for himself while looking out in front of him. Baranuski: "You seem distressed my son, is there something I can help you with. Please I can lend an open ear and offer much wisdom. " Kohaku: "You can't help me, my life is ruined. I'll never have the woman I love. " Baranuski: "Ah yes, I remember now...I broke bread with your sister, Lady Sango. Yes, she informed me of your dreadful situation. The young girl you wanted to marry, Rin, she has gone off and married a demon abandoning you." 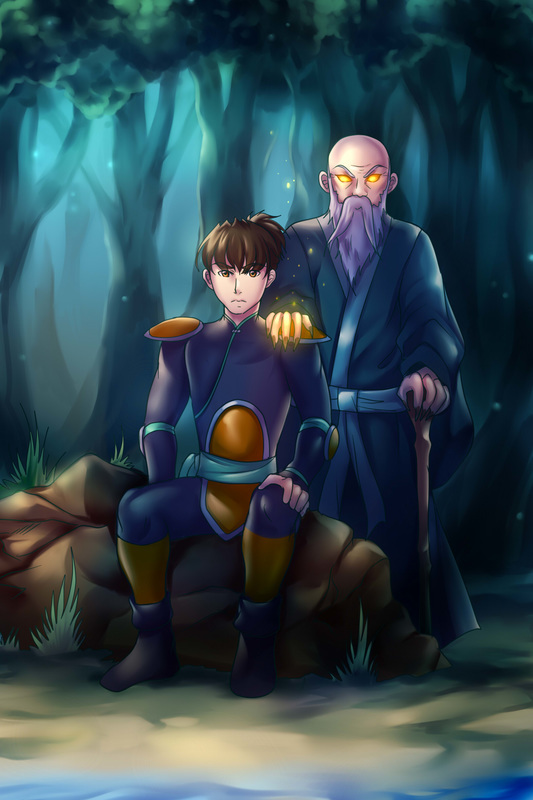 Baranuski walks over and sits with Kohaku and places a hand on Kohaku's shoulder as a jester of comfort but in reality he is sending a surge of intense power through Kohaku's body to intensify the bitterness he is feeling toward Rin for breaking his heart and the anger he feels towards Sesshomaru for stealing Rin away from him. The longer Baranuski keeps his hand on Kohaku's shoulder he knows what he is feeling, he knows what Kohaku knows and can harden his heart more with each passing moment. Baranuski: "After all the times you and she spent slaying demons together, all the times she allowed you to kiss her, allowed you to embrace her and caress her, knowing full well the whole time she was in love with another. This is an awful situation for you indeed. She has betrayed you, what an awful girl to pretend as if she cared for you when in reality she was only using you to help her learn to demon slay. Kohaku: "No, your wrong. Rin does care about me...we care for each other. Kohaku becomes suspicious and stands up quickly causing Baranuski's hand to fall from Kohaku's shoulder....Kohaku ready to draw his weapon on the man. Kohaku: How do you know all this stuff about Rin and I old man?? My sister never told you this. Baranuski: "My son, I am old and I have traveled all over these lands. I have experienced the same disappointing situations that you are enduring now. I have gained much wisdom about such things. I don't need you to tell me the details, I already know them for they were once my own. Kohaku slowly sits back down next to the old traveler and Baranuski again places a hand on Kohaku's shoulder. He continues talking and trying to intensify his feelings. However this is not as easy a task as Baranuski thought it would be...Kohaku's love for Rin is so strong that it takes many attempts to reverse the love into hate. The traveler continues to meet Kohaku at the lake every day, he befriends Kohaku so that he can feed Kohaku's heart and mind with hatred for Rin. Meanwhile as the months go by, Rin is enjoying her time with her husband and Jaken at the empire. As Rin and Sesshomaru expected, some of the demons that were serving under him abandoned their master when they learn that they must also serve and obey a mere human woman as their queen, However Sesshomaru being powerful and strongly worshiped....most of his servants do remain on, allowing him to still have a hefty empire of demons that serve him and Rin faithfully. The many loyal demon servants such as Jaken do not question Master Sesshomaru's motives and they do his bidding without question. Rin loves the new empire but she finds herself thinking of that beautiful forest that Sesshomaru passed on to her. Time has passed and she is in her fourth month of pregnancy now and must be careful while traveling. Au Un carries Rin as they walk to the forest which is close to the empire but far from Lady Kaede's Village. When she arrives at the forest and stands near the lake, she looks out and marvels in it's beauty, she thinks of many things. She thinks about Kohaku and the others at the village, She thinks of her new life as queen of an empire and she thinks of her unborn child, Will it be a girl or a boy? What shall the name be? Rin thinks: well, this forest will make a lovely play area for our child ; I will train the child in fighting techniques and demon slaying here as well. Rin spends a while at the beautiful forest thinking about her plans for the baby, she decides to take leave and allows Au and Un to carry her along once more back to the empire. while traveling she feels pain coming from her belly and is worried about the child. She makes it to the empire safe but informs her husband that she has been experiencing some minor pain and believes that she should be closer to the village doctor for a while. Sesshomaru agrees and he has servants prepare Au Un for the long walking trip back to Lady Kaede's village, Sesshomaru does not allow Au Un to fly Rin anywhere while in her current state, Sesshomaru orders Jaken to accompany her and protect her until she is safely back at the village. Sesshomaru informs Jaken that he will fly there in a few days. Jaken worries as usual that he will fail Lord Sesshomaru and will most likely be severely punished if anything happens to Rin or the unborn child. The trip takes two days and she has to spend time in the forest with Au Un and Jaken as she used to when she was little, she has many flash backs of those times and she thinks to herself that this moment brings back memories. The trio make it to the village safely which is a huge relief to Jaken. The first person Rin sees is Lady Kaede, Rin so happy to see lady Kaede hugs her and kisses her softly on the cheek. Lady Kaede prepares Rin something to eat and a warm cup of tea while Rin sits and tells her all about life at the empire. Rin informs lady Kaede that she has been having pain and trouble with the unborn child. Lady Kaede welcomes Rin to remain with her and she will have a village doctor exam her again, she will also deliver Rin's baby when the time comes. Lady Kaede is over joyed at Rin's return that the news spreads quickly that she is back and will remain in the village until the day of the child's birth. When Kohaku hears that Rin is back in the village, his heart is cold for her and he does not go to see her or even show any excitement at her return. He speaks with what he thinks is his friend and confidant....Baranuski.....who continues to harden Kohaku's heart and intensify his hatred for Rin and now that Rin is back in the village Baranuski can make his final suggestion. Placing a hand on Kohaku's shoulder, he exclaims: "I understand your feelings my son. You are feeling like this girl betrayed you, she kept secrets from you, she played with your heart and in the end she made you out to be a fool. You attempted to propose to her, did you not? Shall I tell you why she turned you down? Because she never loved you, she never even liked you... It's always been him. (Kohaku feels anger and his blood boils as Baranuski continues to speak) She will give birth to his child soon... does that not prove that she never intended to be with you? She never even said good bye, she just left off with that demon husband of hers, she didn't even have the decency to marry a man of her own kind. Hmmm, wouldn't you rather see her dead than in the arms of a demon Kohaku? She's here in the village you know, here with that half demon growing in her belly, Get rid of her and that awful demon child? Rin is at Lady Kaede's hut, talking to Jaken while she prepares fish and rice for dinner. Rin asks him, "Master Jaken, why don't you go out by the lake with Au Un and pick some wild berries and I'll make a delicious pie for us." Jaken replies, " I don't want to pick any berries, what do I know about human food..nothing!" Rin says, "Well, That doesn't seem to be stopping you from eating fish and rice for dinner tonight. C'mon Master Jaken....you'll love a sweet slice of berry pie after your dinner." Jaken submits, "Oh alright..but don't blame me if I pick the wrong ones." Rin assures him, "The trees near the lake have lots of different berries, bring back any kind that look good to you. Don't forget to take a basket Master Jaken." Jaken grabs the empty basket and complains, "Next thing you know, You'll have me picking berries and baking pies as well." Jaken takes Au Un and goes out near the lake to pick the berries. After several minutes, Rin hears someone come into the hut and she calls out, "Granny Kaede? Is that you? I'm preparing dinner now." Rin turns around and she sees Kohaku standing in the doorway. Rin is surprised and alittle ashamed to see him. With everything happening so fast, she never got the chance to explain things to Kohaku. In a surprised voice she says, "Kohaku? I'm glad you've come...I had planned to come see you tomorrow." Rin notices that Kohaku looks odd, he is not saying anything and his eyes seem to have so much anger in them. Rin asks, "Kohaku, Is something wrong? Are you okay? Kohaku draws his sword with the intent of slaying Rin down as he answers her, "I will be fine once I am rid of you and my thoughts of you!!!" He raises the sword above his head intent on blowing a vicious strike however Rin being fast in demon slaying is able to dodge it quickly. The sword strikes down with much force causing a huge crack on the floor when it hit. Rin is in complete shock, trying to understand Kohaku's actions she asks him, "Kohaku, What's the matter with you? Don't you recognize me??" Kohaku responds, "No, I don't know you Rin, I thought I did. I thought you cared for me like I cared for you but now I see you are nothing but a lover of filthy Demons!!!" He shouts as he attempts to strike her again with the sword but Rin grabs a pot that is nearby and blocks the strike. Rin in her current state is unable to fight Kohaku off nor would she normally have the heart to but Rin is determined to protect her unborn child and does what she has to. Kohaku goes to strike her a third time but Rin quickly uses the heavy pot to strike Kohaku...It hits him on the side of the face and he moans in pain and falls to the floor. Rin takes that chance to flee, she runs outside but Kohaku is up and right on her heels. Rin tries to run but is unable to move swiftly due to her condition. Kohaku drops his sword and pulls out his Kusarigama weapon, he throws and swings and it scraps Rins back slightly as blood seeps and she yelps in pain. Rin crouches down and holds her belly as Kohaku comes up behind her, he pulls Rin by the hair and holds her neck back to slit her throat with his sharp hook blade of the Kusarigama. but he tells her first, "Rin, I love you too much to see you in the arms of a demon. I won't let you bare children with him. I'd rather see you dead! " Rin tries to reason with him, "Kohaku, what are you saying? I'm married to Lord Sesshomaru, you know Lord Sesshomaru...he risked his life many times to save both our lives. Have you forgotten that?" Kohaku replies angrily, "I don't care, If I can't have you...I won't let him have you either." Just then Jaken appears and uses his staff of two heads causing Kohaku to feel an intense burn at his back loosening his grip on Rin. Kohaku turns towards Jaken as Jaken asks, "Kohaku, have you lost your mind!? Lord Sesshomaru will have your skin for this!" Rin shouts, "Master Jaken, take Au Un and get away quickly before he kills you too!!" Jaken ignores Rin's warning and attempts to use the staff once again but Kohaku is quick and knocks it out of Jakens hand at the same time rendering Jaken unconscious. Au Un then tries to fire at Kohaku but he quickly deflects the strike with the blade of his Kusarigama weapon. as he swiftly snatches Rin up by the arm and faces her toward Au Un while placing the blade at her neck again. He shouts to Au Un, " Au Un, if you strike at me again I will kill her right this very second." Rin shouts, "Au Un, Please go and find Lord Sesshomaru!!" Kohaku slowly walks backward gripping Rin with one arm and holding the hook at her throat with the other while trying to head back into the hut with her as quickly as possible, he tells her, "By the time that good for nothing demon gets here, it will be too late." Au Un flies off to search for Sesshomaru in the hopes he can help Rin but fears he will not be able to get to Lord Sesshomaru in time. 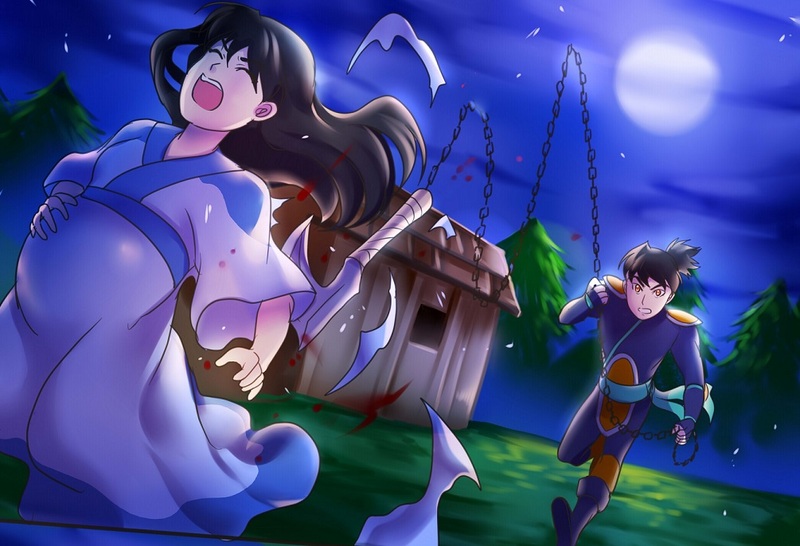 Once back in the hut Rin and Kohaku are alone, still having a hold of her arm he pushes her down with great force and she lands on her back as Kohaku walks toward her with the hook. Rin sits up and declares angrily, "Kohaku, I love you but I won't let you hurt my child, I'll fight you with everything I have in me." Kohaku abruptly stops walking and says, "What?? You love me??" ​Rin looks at Kohaku with surprise that he is confused by her words as she confirms, "Of course I do, why would you think that I don't?" Kohaku responds, "You married Sesshomaru, You abandoned me and it hurt me to my soul." Rin explains, "Kohaku I wanted to tell you so many times but the truth is I didn't want to hurt you but It looks like I did anyway. Kohaku I've loved Lord Sesshomaru since I was a little girl, I once wished to be with him forever and now my wish has come true but I love you also, becoming your wife has been in my thoughts many times. I am sorry that I hurt you but Lord Sesshomaru is the one I was destined to be with always. I hope you can understand Kohaku." Kohaku grips his hook as he ponders over her words, he raises the hook one last time as Rin braces herself to grab hold of the handle of the hook, but Kohaku strikes the floor purposely this time in anger of his own actions. He joins Rin on the floor and grabs her to embrace her with a strong hug as he tells her, "Rin, I don't know whats happening to me....I could never hurt you." Rin tells him, "Kohaku, I know I've hurt you." Kohaku begs, "Rin please forgive me." Rin replies, "I do I forgive you Kohaku...I know you were not yourself." 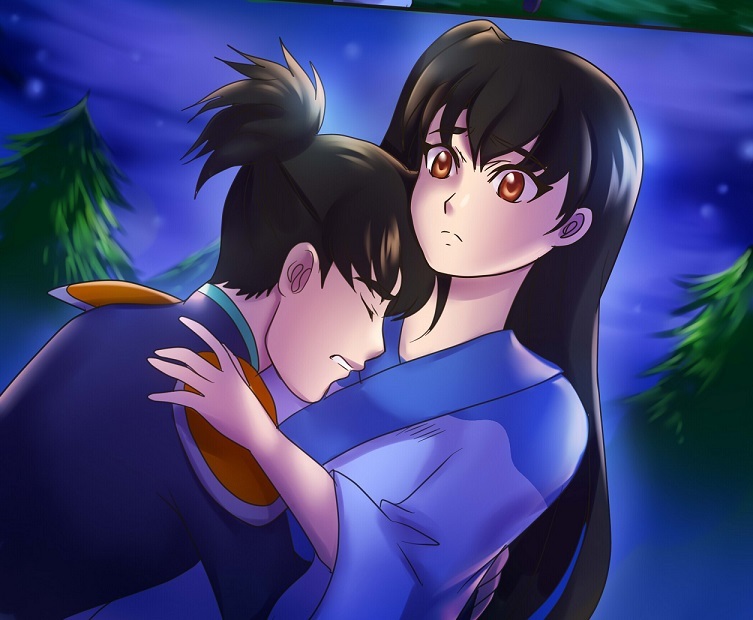 Rin and Kohaku remain in an embrace for a few moments when Rin remembers that Au Un has gone to find Lord Sesshomaru, she warns Kohaku, "You have to get away from here, Lord Sesshomaru will be looking for you...I'll need time to convince him not to harm you." Kohaku feeling much shame for his actions tells her, "I don't deserve to live after this." Rin shouts, "Stop it Kohaku, you were bewitched, I know you too well, Someone prompted these feelings in you. Now go before it's too late. " Kohaku thinks about the man he has befriended and thinks Rin may be right. He kisses Rin on the cheek as he leaves the hut. Rin goes outside to revive Jaken with cool water. Rin is able to revive Jaken as he wakes he says, "Oh Rin, you're alive!! I thought that blasted Kohaku surely destroyed you and the child for sure. What could have caused such change in Kohaku?" Rin looks up and tells Jaken, "Kohaku was possessed, just like before." Just then Au Un and Sesshomaru appear, they flew as quickly as possible to reach Rin. Jaken shouts out, "Lord Sesshomaru, thank goodness you have arrived." Sesshomaru walks up to Rin and grabs hold of her,he smells and sees the bloody wound on her back as he asks her "Rin, what happened here?" before Rin can answer Jaken informs him, "Kohaku turned insane and attacked Rin and I." Sesshomaru seems bewildered by this but it doesn't matter to him as he responds, "I will take care of Kohaku directly." Rin stops him, " Lord Sesshomaru please, Kohaku was under some type of spell, the same as when he and I were younger. He came to his normal senses before he did me any real harm. I'm okay and I'm sure the baby is fine so please My Lord, show him mercy." Sesshomaru knows Rin has a good heart but he explains to her, "Rin, he may come after you again. Kohaku is weak and highly susceptible to demonic possessions. I don't trust him." Rin reassures him, "I'm sure we have nothing to worry about, Jaken and Au Un did well to protect me and in 2 more months I will give birth to our child so that we can return to the empire as a family." Sesshomaru thinks to himself: Rin has a close friendship with Kohaku, she will harbor a cold spot in her heart for me If I were to kill him against her wishes. Sesshomaru places a hand on Rin's belly feeling for the childs movements, he then responds, "Very well, Jaken and Au Un will remain with you for the next two months. You will give birth to our child and we will leave this human village for good."